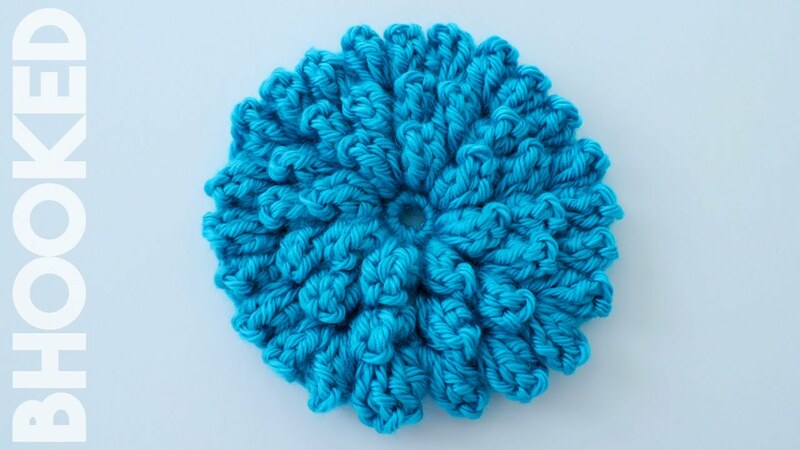 The popcorn stitch is formed by double crocheting 5 times in the same stitch, removing the hook from your 5th double crochet loop, inserting it through your first double crochet stitch and grabbing the 5th double crochet loop through the back and pulling it through. You will then fasten the popcorn stitch off by chaining one. Round 2: Ch 3 and form a popcorn stitch in the same stitch as your ch 3. Close your popcorn stitch by chaining 1. Make a popcorn stitch in each sc stitch all the way around your loop. (8 popcorn stitches=8 petals) Join with a slst into the bottom ch 3 of the first petal of this round. Round 3: Chain 3 and form a popcorn in the same stitch. Close the popcorn stitch by chaining 1. (you will add one more popcorn stitch to this section at the end of the round). *Create two popcorn stitches between the next two petals from the second round. You will insert your hook under the chain that closed off your popcorn stitches. Repeat all the way around and finish off the round by adding one more popcorn stitch between the petals where the first popcorn stitch was made. Join with a Slst into the ch 3 of the first popcorn stitch. (16 popcorn stitches=16 petals).